cannot connect to citrix xenapp citrix xenapp server protocol on Who Was Dorothea Lange’s Migrant Mother? Bob on Who Was Dorothea Lange’s Migrant Mother? email marketing tips pdf on Who Was Dorothea Lange’s Migrant Mother? This site has its origins in my own search for public domain images that I could use in a for-profit publication, a guide to Philip Pullman’s His Dark Materials.My intention is to save those involved in the same pursuit some time and bother. There are lots of sources for “fair use” images for non-profit or educational purposes, and perhaps many of those would be willing to give permission without charging licensing fees to for-profit projects if asked. Perhaps. But I wanted to avoid the permissions pursuit and paying licensing fees was not an option, so images that are unambiguously public domain were the best option. I imagine others are similarly situated. Now that I am looking at public domain images without the urgency of finding particular subjects, I am enjoying browsing around, and I find my posts going off in directions that diverge from my original intention. But that’s fine too. If I’m enjoying writing these posts, they’ll keep coming, and perhaps be of use to someone. What is certain is that an unwritten post is of use to no one. If you are looking for images on particular subjects, let me know and I’ll see if I can help. Like most others here, I stumbled upon this site while looking for public domain photos, and I am thrilled that I did. This site is a huge help in narrowing my search parameters. What a wonderful idea to post images and discuss them. I also want to mention that http://www.BarbaraWaxer.com has a great list of sources for free images like the U.S. Antarctic Program Photo Library. And finally one article I read about “Migrant Mother’ pointed out that Lange was drawing on a long history of painting–I don’t have a clue how true this is, but the authors posted some paintings suggesting they weren’t talking through their hat– showing a mother with two children and forming a triangular composition; only in Lange’s photo, the mother is far from peaceful or beatific, and the children are turned away from the camera. Someone above wanted iceberg photos. I don’t know how dramatic you want them to be–or even how old the post was– but my husband shot some great ones on a trip to the Arctic.I’m sure he’d allow their use for free as long as he got attribution. I’m book marking this site for sure. We’re searching for public domain photos of icebergs both above AND below the waterline to use for a book on personal development. Any help would be greatly appreciated. this is a great site and I really appreciate it. I am creating a commercial product that uses photos and other images. I don’t have much money, but I also want to be careful to use images that are in the public domain. This site is perfect for my needs, thanks for creating it. I typed a query into Google about copyright and public domain and your site came up. An hour of browsing later, I’m finally getting around to posting a comment. Outstanding images here! Thanks so much for doing this work. I am about to publish a book that has many images of Hoover Dam and its construction, but I’m having a very hard time figuring out the copyrights and clearances for some of the images. For example, paintings by Stanley Wood about Hoover Dam were created under WPA but published in Forbes Magazine, so do I need copyright permission from Forbes, or can I use it under public domain since the creator of the original was working for the federal govt? Another image from Arthur Murphy was originally created under WPA then was gifted to the Smithsonian American Art Museum by a private donor. Can I use it (giving proper credits, of course)? If I might pick your brain about a few scenarios, I would be most grateful and be happy to pay for your time. Please email me. It’s really complicated. This came up for me when I wanted to use murals in US Post Offices by WPA artists. The problem was that while the mural was as much a federally financed work as the posters and prints in the Library of Congress’s collection, the photographs of the murals were not, although it seemed to me if they were taken by a postal employee during work hours they should have been. The Library of Congress has of course also photographed and digitized original posters, but they do not claim ownership of the images, unlike most libraries and museums. The Smithsonian is a case in point. It claims copyright protection of its images (but arguably it may not be entirely supported by Federal funds). I’ve always felt that since for insurance purposes they surely must have photographed the entire collection, and since much if not all the source of money for that process was taxes, then its images should be in the public domain, but I haven’t ever included any from there because I am trying very hard to be cautious here. I searched quickly for Stanley Wood and Arthur Murphy in Library of Congress P&P catalog and didn’t turn up any paintings. Your publisher is your best resource for these question, since it will bear the cost of any mistakes. I know that the National Archives also has a number of WPA works available for download. There are 363 public domain images of the Hoover Dam at the Library of Congress [LoC]. Most are from the Historic American Engineering Record, but there are several lovely full color works by Carol Highsmith, who has placed thousands and thousands of tremendously vivid photos of contemporary America in the public domain and these are accessible at the LoC. Anyway, I just wanted to say thanks for sharing your wealth of images with all of us. If it wasn’t for sites such as this and the ones who do the actual scanning and online posting of the materials, I have no doubt that so many of these gems would be lost, or at least no longer available to the average person. I’m an independent filmmaker looking to use photos of Dr. Martin Luther King in a documentary. What a great idea, thank you very much. I’ll tell you if I find sources that you haven´t already found. Congratulations on your website, it was very useful for me. I’m a Spanish researcher. I work for an NGO (Non-Governmental Organization) and we are about to publish a report. One of the issues is International Migrations. I’ve found some of the Dorothea Lange pictures and I would love to use one of them for the report. The problem is that the size of the ones in the web page is too low. Would it be possible to have access to a bigger size. I’m talking about the following pictures: 03054r, 8b29525r, 8b29516v. We are publishing the report next week (Tuesday 10th January 2012) so I would really appreciate your response as soon as you can. Congratulations for your great job! Any assistance you can lend to my quest would be greatly appreciated! I’ve just stumbled across this blog, and am looking forward to wandering around it. What a great idea! Thank you-your site is a wonderful resource, and I applaud you for making it free! I’d like to let you know about a public domain image service I offer; if you are willing to share the info with your users, that is great; if not, I understand. As a picture researcher with years of experience, I now also have a site selling public domain images (no licensing, no restrictions: I charge low fees to cover my time in finding, sometimes scanning, verifying copyright-free status, obtaining high-res versions, prepping, keywording and hosting). Most images are $5-15; a handful are up to $45. I have one additional service that some of your users may find helpful; digital delivery of high-res Library of Congress images in 48-36 hours for $15, less than the cost of a LOC print or digital file. Many people don’t need the higher-res versions, and many can afford to wait the standard time. For those that can’t, I can offer quick results for a fair price. Thanks for all of your work in making some of these great images widely available, and with interesting commentary to boot! I neglected to post the web link. It is http://www.eonimages.com/about. Hello! Love this site. 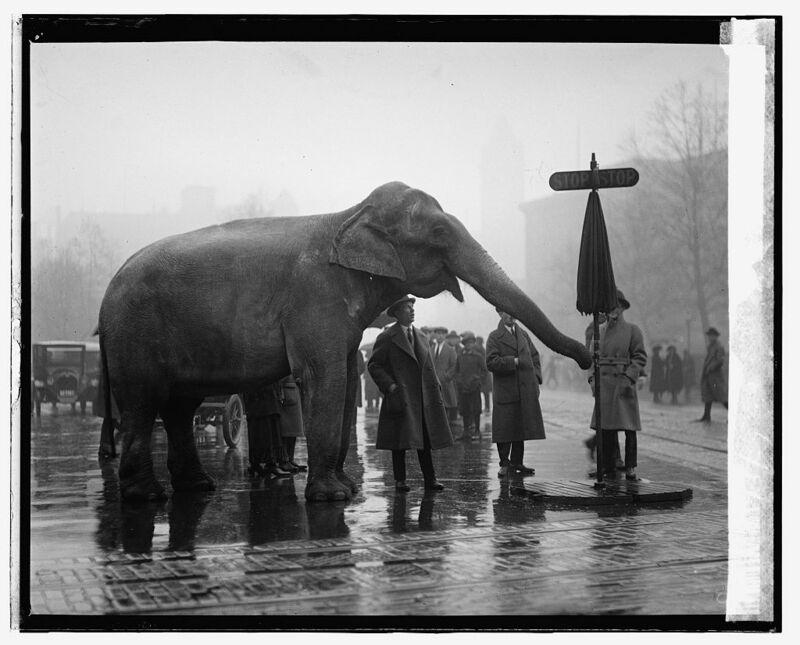 I am looking for a bigger version of this elephant photo- [LOC, LC-DIG-npcc-10024 ] (that was the title underneath it). I want to print it at 150dpi for my wall- is that even possible. Right now it is 450×362 pixels, so kinda small! Any chance it is bigger anywhere else?? Thanks for your help! You can download a 1024 x 825 pixel JPEG (view here: http://lcweb2.loc.gov/service/pnp/npcc/10000/10024v.jpg.) There is also a 21.2mb TIFF you can download. Go here: http://www.loc.gov/pictures/item/npc2007010023/. If you are looking for a print, suggest you start here: http://www.loc.gov/duplicationservices/photo.html, the page for Ordering Photographic Reproductions from the Library of Congress. Hello, you higher resolution of this elephant photo- [LOC, LC-DIG-npcc-10024 ]. This was the link below the picture. I want to reprint it much bigger then it currently is 450×362 (I am allowed to reprint it for my wall, correct?). If I could get it at 150 dpi, that would be awesome, is that even a possibility. Thanks! This site is great! Well, your comment engine ate the URL I entered! Vanished utterly. Too bad there’s no preview. Hopefully one of these will get through. These are fantastic. Thanks! Tell me more about where you found sources (CIA Factbook, right?) and how you devised them (as simply as you can) because I’d like to do a post on them rather than have the only reference to them buried here in Comments. A question: I see on your Home page a copyright notice, but map page says that maps are public domain. I’m a bit confused. > Tell me more about where you found sources (CIA Factbook, right?) and how you devised them (as simply as you can) because I’d like to do a post on them rather than have the only reference to them buried here in Comments. Linear data is via WDB3 (my own update of WDB2). Topo data is ETOPO2v2 for larger countries, and SRTM 3″ for smaller (Space Shuttle data). Cities are via MaxMind’s city database. All other data is from other public sources, or my own. > A question: I see on your Home page a copyright notice, but map page says that maps are public domain. I’m a bit confused. I am a programmer, so I am about the software, not the maps. The software, PAT, is copyrighted, but free and open source (FOSS). The maps I produced as part of the test suite, and as proof of concept: the point of the code is to draw maps like those, so how do I know it has “fitness for a purpose” unless I actually draw some? Eventually I mapped all 238 entities with an ISO country code (plus 46 regional maps), and continued code development to support whatever features were needed for those maps. I was still encountering strange situations that required code changes right up to the last few maps. Coding is finished for PAT 1.1, and I am working on the release now. The maps were already done, so I released them in the Public Domain ahead of time. The maps and photos are public domain, and I include links to my sources so you can go there and download size and resolution you want, and I tell you how to credit source. What I don’t want is someone just lifting my whole posts, my text, and posting them as their own because I do a fair amount of work to collect these images and their info. I should clarify that and will add it to my list of things to do. More later. I’ve been searching the public domain archives myself, and am very pleased to see someone taking the time to share the fruits of their labour. The archives are so vast, your work is a great help to those of us similarly engaged. This is a most valuable site, a rare gem. Thanks! I really appreciate hearing from you. I’ll keep at it as long as I know it is helping someone or is of interest. Thanks for writing! The National Archives website comes to mind immediately, but I’ll look around and see what else I can come up with, too. Best Wishes. I am looking for a high resolution of the image in your site called: 30-N-36713, american-cities-100. DO you know where I could find it? This is what I would suggest: Visit Pictures of American Cities at http://www.archives.gov/research/american-cities/#order. At the bottom of that page you’ll find this link: Ordering Still Picture Reproductions http://www.archives.gov/research/order/still-pictures.html. Then follow the contact links. Glad you enjoy the site. Good luck! I found a nice Mangrove shot while browsing Google images, and this led me to your site. The image is entitled mangrove 1.jpg. If I could find a hi-res version of it, this would be a great background shot for a display in an educational center in Rockport Texas. If you know of a such a shot, please let me know. Hope you find what you need in today’s post.